(Nanowerk News) Scientists at the Walter and Eliza Hall Institute and their collaborators have tailor-made a new chemical compound that blocks a protein that has been linked to poor responses to treatment in cancer patients. The development of the compound, called WEHI-539, is an important step towards the design of a potential new anti-cancer agent. WEHI-539 has been designed to bind and block the function of a protein called BCL-XL that normally prevents cells from dying. The death and elimination of abnormal cells in the body is an important safeguard against cancer development. But cancer cells often acquire genetic changes that allow them to bypass cell death, which also reduces the effectiveness of anti-cancer treatments such as chemotherapy. 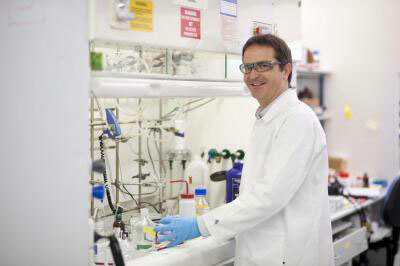 Dr Guillaume Lessene and his collaborators have tailor-made a new chemical compound that blocks a protein that has been linked to poor responses to treatment in cancer patients. Dr Guillaume Lessene, Professor Keith Watson and Professor David Huang from the institute's ACRF Chemical Biology division, and Dr Peter Czabotar and Professor Peter Colman from the institute's Structural Biology division led the development of WEHI-539 in collaboration with colleagues at Genentech, a member of the Roche group. The research is published online today in the journal Nature Chemical Biology ("Structure-guided design of a selective BCL-XL inhibitor"). Dr Lessene said the development of WEHI-539 was an important milestone on the way to creating potential anti-cancer agents that act to restore cell death by inhibiting BCL-XL. "Although WEHI-539 is not optimised for use in patients, it will be a very valuable tool for researchers to use to dissect how BCL-XL controls cancer cell survival," he said. WEHI-539 belongs to a class of chemicals called 'BH3-mimetics', which all bind to the same region of BCL-XL or related proteins. Two BH3-mimetics, called navitoclax (ABT-263) and ABT-199/GDC-0199 are currently in clinical trials for the treatment of cancer, particularly those of the blood and lymph glands (leukaemia and lymphoma). Dr Lessene said WEHI-539 was the product of a sustained research program. "We were very excited to see the team's work culminate in a compound that specifically inhibits BCL-XL," he said. "WEHI-539 is the first compound that our chemists have developed from scratch, using the three-dimensional structure of BCL-XL to build and refine its design."